This page is dedicated to different sites, on-line resources and services which can help playing card collectors, designers and producers in their exciting virtual part of the hobby or business. 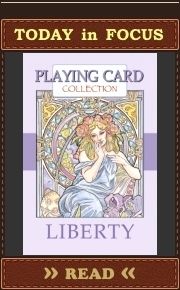 PlayingCardCollector.net doesn’t own them (their logos or the logo’s elements), isn’t their subsidiary, isn’t responsible for their work or content and vice versa. Based in San Francisco, Collectors Weekly is an on-line resource for people who love vintage and antiques. Its aim is to build a great place to explore, learn, and experience the passion and knowledge of collectors everywhere. It is run by an avid collector, Dave Margulius. Collectors Weekly proposes in-depth information on more than 1,500 vintage and antiques categories, subject articles and posts, interviews with antiques experts, etc. Playing cards aren’t an exception for this resource. It collects different interesting propositions (including playing cards) from top eBay auctions. So, it can be useful for researchers as well as for buyers / sellers. Collectors Weekly has also a collection of links leading to many interesting on-line places dedicated to different collectible items. Jeff Morin founded Coins For Anything, Inc. in November of 2002 with the goal of providing the finest custom-made challenge coins on the market and an inventory of unique, relevant designs for collectors. His first attempts in this field was connected with creation and production of military challenge coins. But coins have dramatically grown in popularity for non-military applications. The world of playing card collectors isn’t an exception. Quite a lot of such collectors like to have high-quality subject coins, card guards, and dealer buttons as additions to packs of playing cards. This tendency is reflected on pages of crowdfunding playing card projects (first of all, on Kickstarter). Coins For Anything, Inc. was able to become main coin producer for many appropriate project creators. 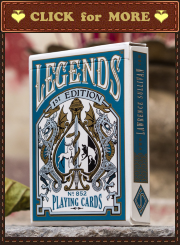 Any playing card collector is always interested in the history of playing cards or separate decks, playing card companies, in all those signs and senses hidden in different examples of playing card art. Some quite universal source of encyclopaedic knowledge will be very useful for appropriate studies. Wikipedia is a free-access, free content Internet encyclopedia, supported and hosted by the non-profit Wikimedia Foundation. It was launched by Jimmy Wales and Larry Sanger on January 15, 2001. Wikipedia’s content was initially only in English. But it quickly became multilingual. Anyone who can access the site can edit almost any of its articles, as long as they follow the rules. At the same time, its accuracy can vary from article to article due to such approach. Wikipedia’s Consensus and Undue Weight policies have been criticised by prominent scholarly sources for undermining freedom of thought and leading to false beliefs based on incomplete information. Playing card collectors can’t be satisfied only with one encyclopaedia. They always need as much sources of information as possible. The Encyclopædia Britannica is a general knowledge English-language encyclopaedia. Its final 15th print edition was released in 2010. The encyclopaedia has been published by Encyclopædia Britannica, Inc. (a company, founded in Edinburgh, Scotland, in the 18th century, now is an American one) until the decision to make it an on-line source in 2012. Now Encyclopædia Britannica is an on-line encyclopaedia with more than 120,000 articles that are updated regularly. It is written by about 100 full-time editors and more than 4,000 contributors, including 110 Nobel Prize winners. The company accepts edits and additions to the online Britannica website from the public. Such articles, if vetted and approved, are only available in a special section of the website, separate from the professional articles. There are a lot of free articles on the site. Lee Asher is a magician and playing card collector, author of different tricks, appropriate tutorials and card routines. He is the first place International Brotherhood of Magicians Junior Close-up Champion (1991 and 1992). Lee also was a lecturer at different international conventions, and he was a guest on many TV shows. His professional skills are connected with playing cards as one of his instruments. Thus, he was involved in the world of playing card collecting. The person is an activist behind the 52 Plus Joker Club and has extensive experience in the field of playing card magic, production, collecting. As we all understand, playing cards aren’t only pieces of art and results of unlimited artist’s imagination. 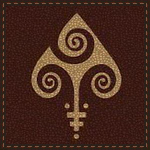 A pack of playing cards initially and traditionally intended for being a card game accessory. And card games themselves are an important part of the history of playing cards. There are hundreds of games involving playing cards. But people need universal rules of a game for all participants to enjoy it. Hundreds of card games imply hundreds of rules (or even thousands of them, taking into account variations of rules). A lot of such rules you can find on the PAGAT site. John McLeod has been collecting rules of card games since 1995. His main focus is on publishing rules of traditional card games for two or more players. John tries to make sure that the rules given on his site are “authentic” – the aim is that they should correspond to the way regular players of the game actually play it. We live in multicultural and multilingual globalized world. This brings a lot of interesting and unusual packs of playing cards to a wide group of playing card collectors from the whole world. So, it’s good in terms of positive opportunities and self-development, but it’s difficult in terms of communications. Unfortunately, you can’t learn all foreign languages, but you can find interesting information about playing cards set out in a foreign language. Can we resolve this problem? Partly… with Google Translate. This service from Google Inc. is a multilingual service to translate written text from one language into another. Now it supports 90 languages worldwide. Quality of such translation will vary from language to language. Modern playing card collectors have wide possibilities to improve their knowledge about playing cards and enrich their collections with new decks due to Internet and different on-line (program) tools and services. But Internet can be not only helpful, but perilous. Different viruses, trojans, malware and other “virtual infection” won’t make any collector happy. So, it’s useful to take appropriate precautions. VirusTotal can be a useful on-line tool for such purposes. It’s a free online service (a subsidiary of Google) that analyzes files and URLs enabling the identification of viruses, worms, trojans and other kinds of malicious content detected by dozens of antivirus engines and website scanners. Remember, it doesn’t substitute appropriate programs on your devices. Any modern playing card collector knows that he can find huge quantity of interesting and unusual decks from around the world, and even buy them at the day of it output due to Internet. Also we can connect with each other across the Earth. But there is some peculiarity which should be counted by us. We work and sleep in different time due to different Time Zones. In this case, some resource with the information about worldwide time and dates will be very useful. Time and Date AS (AS – “Aksjeselskap”) gives people free time and date related information and services via their site. It is a private, limited liability company owned by Steffen Thorsen. The company is based near Stavanger, Norway.